Just when you thought that BMW couldn't bring out anything more luxurious, along comes the 2 Series. This series features everything from a coupe to a convertible depending on what you want to drive in Shelby Township. 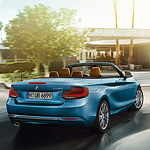 Put the top down, and enjoy the intuitive technology as well as the sleek design features. Various colors to choose from include Seaside Metallic and Sunset Orange Metallic. With 248 horsepower, you can get from zero to 60 in less than five seconds. The weight distribution is almost at a 50/50 point, allowing you to handle curves with precision. Even with the greater horsepower and speed, the vehicle still has exceptional fuel efficiency. Technology features include an adaptive suspension that reacts to acceleration and speed. This allows you to adjust the vehicle to the driving style that you enjoy. BMW of Rochester Hills can offer assistance in making further adjustments to these components if needed for a better sports package.